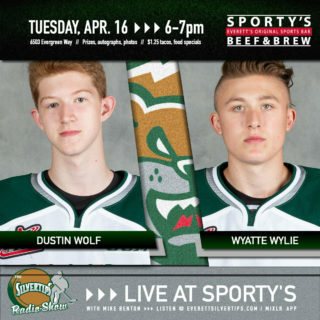 The Silvertips face the Rockets for the final time of four meetings this season … the Silvertips own a 9-0-2-1 record in the last 12 lifetime meetings … the Silvertips are looking for their 4-0-0-0 regular season record against the Rockets in franchise history … the Silvertips hold a five point lead for first place in the Western Conference and seven point lead in the U.S. Division with eight games remaining … Kelowna dropped a 7-6 (OT) defeat to Prince George on Wednesday. The Silvertips hold a five point lead for first place in the Western Conference. The Silvertips hold a seven point lead for first place in the U.S. Division. The Silvertips have 8 games to play. 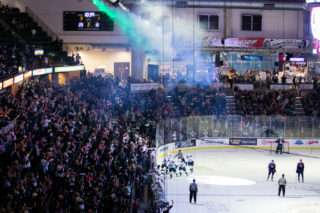 The Silvertips have clinched a playoff berth for the 15th straight season, the longest current streak in the WHL. The Silvertips have a magic number of 11 to clinch home ice advantage in the opening round of the playoffs. IF THE PLAYOFFS BEGAN TODAY: The Silvertips would face the Seattle Thunderbirds in the first round. LAST GAME (SPO 5 – EVT 2 / 2-25-18): Ty Smith collected a pair of assists to help the Spokane Chiefs score five unanswered goals, defeating the Everett Silvertips 5-2 before 6,087 fans in downtown Everett on Sunday in WHL action. Sean Richards and Bryce Kindopp tacked on goals for the Silvertips, who lost for the first time in regulation in 12 games. The Tips, playing seven games in ten days, went 5-1-0-1 in the span. 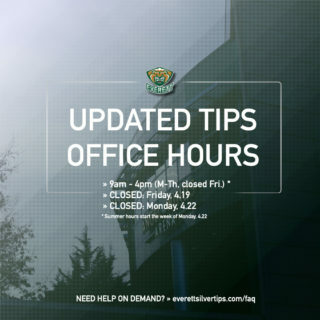 TORRID TIPS: The Tips are 37-8-1-3 in the last 49 games and finished 9-1-1-1 in February… they have won 32 of the last 39 games … Garrett Pilon led the Silvertips with 15 points in 12 games during February … they have 4 games of scoring 8 goals or more. NOT STANDING PAT: Patrick Bajkov, the leading Tips scorer, set the new Silvertips all-time scoring record with 264 points on Feb. 2, when he surpassed Zach Hamill with a first period power play goal … has twice tied his career high of 5 points … he needs one goal to surpass the Tips all-time goal record (108). THIS IS 40: Did you know? The Silvertips have surpassed the 40-win mark for the sixth time in franchise history, and third time in the last four years. AGAINST THE B.C. DIVISION: The Tips are 15-2-0-1 against their opponents from the U.S. Division … their next game against a B.C. Division opponent will be Sunday against the host Vancouver Giants. 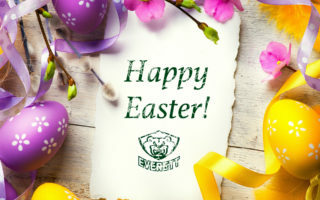 SPECIAL DELIVERIES: For the Silvertips special teams, the penalty kill is 1st in the WHL (84.4) … the Tips power play went 5-of-9 on Jan. 7 vs. Victoria, tying a franchise record for most power play goals in one game (5) … they are 5-of-14 in the last five games … Matt Fonteyne leads the Silvertips with 14 power play goals. 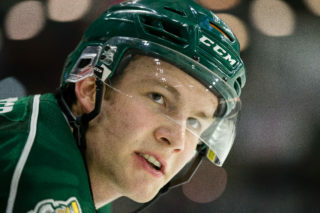 Riley Sutter skated in the CHL/NHL Top Prospects game in Guelph … was given a “B” listing among the NHL Central Scouting rankings for the 2018 NHL Entry Draft, (possible second or third round in the upcoming draft) … through 14 seasons, a total of 19 players through the Silvertips program have been selected in the NHL Entry Draft … a total of 17 Silvertips have advanced to play in the NHL … Sutter has reached a career high in goals (24). Noah Juulsen (D) made his NHL debut Feb. 23 with the Montreal Canadiens vs. the New York Rangers … he became the 18th former Silvertip to suit up and play in the NHL … Juulsen was selected by Montreal in the first round in the 2015 NHL Entry Draft … he had 124 points and 149 penalty minutes in 240 career WHL games, all with the Silvertips.